It sure did take it's sweet time getting here, but I think it's safe to say that Spring has arrivied! I am beyond excited since Spring is my all time favourite season. I just love how after a long dreary cold dead winter, everything comes alive again. Sweet life! Oh how I love you. There's just something so beautiful in how everything just comes forth, all within such a short time frame. Even wet dogs who like the hose a little too much. We let the hens out for a bit on Saturday, to enjoy the sunshine and the grass. Mia did a good job supervising them while resisting the urge to chase them. We're going to start letting them out more often, I want happy free range hens. We even planted a tiny little mini-tree for Earth Day. When I ordered office supplies for work, they gave us this little tree to plant. Ignore the fact that we were almost a week late doing so. At least it got planted. It's basically the cutest tree you ever did see. The only downside to Spring arriving is the huge amount of water. Many cities and towns north of us are flooded and the river going by our house is really high. 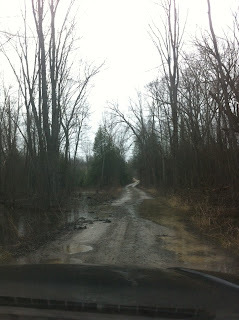 Our little road going through the swamp is almost flooded out, but not quite. It's hard to tell in this picture but there are two huge puddles on either side that are just touching in the middle. So far, we can still drive through it with ease. Overall though, I still love Spring. What's your favourite season and why? Sorry for the boring post title, I'm just not feeling creative this morning. Plus, I didn't want to confuse anyone since it is Monday morning and I'm assuming I'm not the only brain dead one out there. Can you guess what this post is going to be about??? If you guessed blueberries and rhubarb, you're right! I've been wanting to plant blueberries for a while now, but was feeling a little nervous about it ever since Googling how to plant them. Supposedly, blueberries aren't the easiest thing to grow, especially if your soil isn't just right. So I was thrilled when I came across a fabulous local blueberry farm, Wilson's Fresh Blueberries, who sells "blueberry packages". Thank you Vicky for the heads up. We talked to them at a local garden show and then emailed back and forth before finally deciding on three different types of blueberries in three separate planters. We chose three different blueberry varieties, Duke, Bluecrop and Jersey, so that we will have a longer blueberry season. They all ripen at different times so we can enjoy fresh blueberries for longer than two weeks. Cool eh? I can't wait. Planting them in the cedar planters avoids any bad soil issues and we've been told that once they are planted in these planters, they're good for 30 years. The only thing we'll have to do is water and fertilize them. Seems pretty simple to me. We lined the three planters up on our front lawn alongside the driveway. The ground was a little uneven though so we had to help level it off. Dan got out his big green orange tractor and brought in a small load of dirt. Once all the planters were nice and even, we planted our blueberry bushes! Then we covered the blueberries with mulch, to help keep the peat moss nice and moist. See the happy little buds that are starting? That means we'll get some blueberries this summer! I think they look really good along the driveway like that and once they get a little bigger and actually have leaves on them, I think they'll look even better. I also like that we're bringing some more stuff to our front yard, it was feeling a little neglected. Plus, it leaves us more wiggle room in the back for more projects! We also planted rhubarb this weekend. Although unlike the blueberries, it was free. A friend of ours has a whole bunch of rhubarb growing in her backyard and she offered some to us, if we wanted to come dig it up. Which of course we did. We planted it alongside our garage where it gets plenty of sun. The only downfall to this location is that its protected by the overhang so we're going to have to water it faithfullly. It looks so small in that above picture. But pretty soon it will be growing and producing yummy rhubarb for us! Although we were told not to pick any of it the first year, in order to give it time to really root. So next summer we'll be enjoying the rhubarb. That is just part of what we accomplished this past weekend, as we worked some more on our hen house and chicken coop, but that's all the updates you'll be getting for today. What do you think? Do you like our pretty blueberry planters? Do you grow any blueberries or rhubarb? Any tips or comments? So guess who has shin splints? Ow they hurt. Whenever anyone mentioned them in the past, I never really thought much of it since I had never experienced them. But now that I'm starting to, I felt the need to whine. I feel like my running is coming to a quick end. Or at least a quick break. I've been at it for four weeks and have been doing well. I am proud of myself for sticking with it and continuing, even though it's getting harder and I feel like quitting more often. 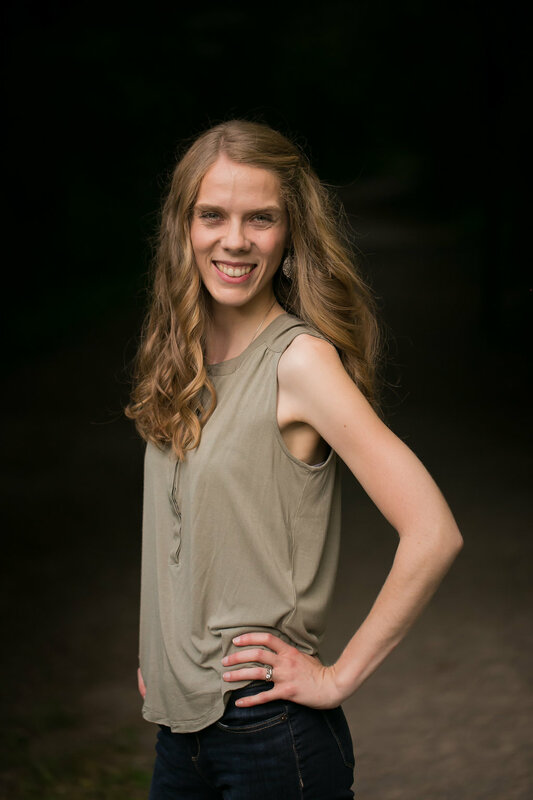 Overall, I don't have many complaints about running. Until last night that is. I went for a "baby" run since I wasn't feeling that good and by the time I got back, my shins were hurting. I figured it would pass quickly but nope, they hurt all evening long. And still some this morning. Ugh. So other than whining about my sore legs, I also wanted to ask for help. I really don't know much about shin splints or anything to do with exercising really. What do I do to make them feel better? Do I need to stop running? For how long? Can I prevent it from happening again when I start running back up? Any tips or advice? While we were on a building spree, we decided to tear down and rebuild the hen house for our little brood of 12 hens. The initial hen house was already there when we bought our house and we just moved our chicks/hens into there. But over time, we realized it wasn't that well built and it was horribly set up. In order to collect the eggs, feed the hens or clean out the coop, you had to basically crawl into it and be hunched over the whole time. Not ideal. 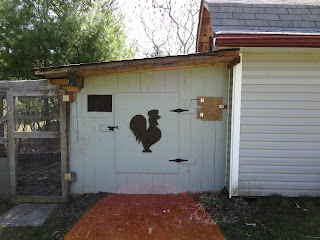 Here is a before shot of the hen house that was taken last spring. It was cute but wasn't working for us. So project "tear down the hen house" began. Dan did 99.9% of this project on his own so I'm not going to take any credit for it. He even took 80% of the pictures. I'm pretty impressed with his skills of taking apart the hen house. I would have had no idea where to start and probably would have ended up getting myself killed. Or at least injured. To take down the super duper heavy roof, he knotched out the poles and then pulled it down using his truck. Smart guy, eh? Once it was down, he then chopped it up into smaller pieces and we loaded it into his truck and took it to the dump. Here he is, posing with his handiwork. And there you have part 1 of the hen house rebuild. We were left with a nice clean slate to work with. Stay tuned for part 2 next week where I will post about it going back up, only bigger and better! I'm not sure how many of you memorized my 13 Goals for 2013 (what do you mean no one did???) but on that list I mentioned that we wanted to plant a hedge. The reason for the urgent desire to plant a hedge is because of our neighbours. They aren't our favourite people ever and we needed to have something dividing our backyards, they were just too close and connected. For your viewing pleasure, I have used my artist skills and drawn up a sketch of our lots. Do you like it? I know, I really shouldn't be quitting my day job. 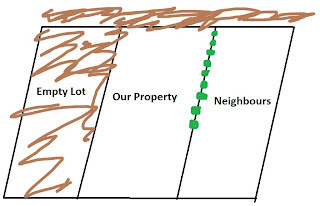 Anyways, as you can see from the sketch, we are very fortunate in the location of our lot. All the brown on the empty lot represents trees/bushes/overgrowth and gives us lots of privacy in that direction. The brown behind the house is acres and acres of woods and the green represents our new hedge! Before the hedge, our backyard and our neighbour's backyard kind of just melded into one. Since we live in the middle of nowhere, we couldn't just put up a fence as that would look out of place and awkward. So we voted on a hedge. One Saturday in the beginning of April, we innocently went grocery shopping and just stumbled upon a cedar tree sale. $16 each and it was a no tax day! We immediately jumped on it and purchased our 40 trees. We didn't actually take them home that day since we were headed to Toronto for my birthday weekend, but we promised to return on Monday to get them all. Monday morning I headed off to work while Dan and Kendall (remember our electrician friend from this post?) picked up the trees and set them up along the property line. They then stayed like that for almost two weeks while we scrambled to get the chicken coop and hen house built. But we eventually got sick of them blowing over and we decided they really needed to be planted before they died on us. So last Thursday night we got to work. First, we measured out where they would go by using a measuring line, marker paint and a chunk of wood. Once we had the line marked out, we were ready to plant! See how ready I was? Digging holes is actually a lot harder than I thought it would be. Or maybe that's because I'm weak and not used to it. Either way, I did my part. I planted three trees in the time it took Dan to plant nine. I blame my slowness on the fact that I'm so light, I couldn't get my shovel deep enough into the ground. But I was proud of my three trees I planted all by myself. I was actually pretty impressed with our progress that first night, 12 trees down, 28 more to go. Oh, and I can't forget to throw a picture of Dan in here, since he technically did 98% of the work for this hedge. On Friday I headed off to work again and when I arrived home, the rest of the trees had been planted. All but one that is. Dan had saved me one last tree and even made a nice little sign for it. I forgot to take a picture of the sign propped up against the unplanted tree since I got distracted by my brother and his wife and daughter arriving, but I did remember to snap a picture the next day with the tree all safe and sound in the ground. Planted by me, of course. I'm so excited to have the hedge planted and be able to cross such a big project off our to do list. It looks kind of sad and thin right now but it will grow and fill in soon enough. What do you think? Do you like our new hedge? Have you ever planted a hedge before? 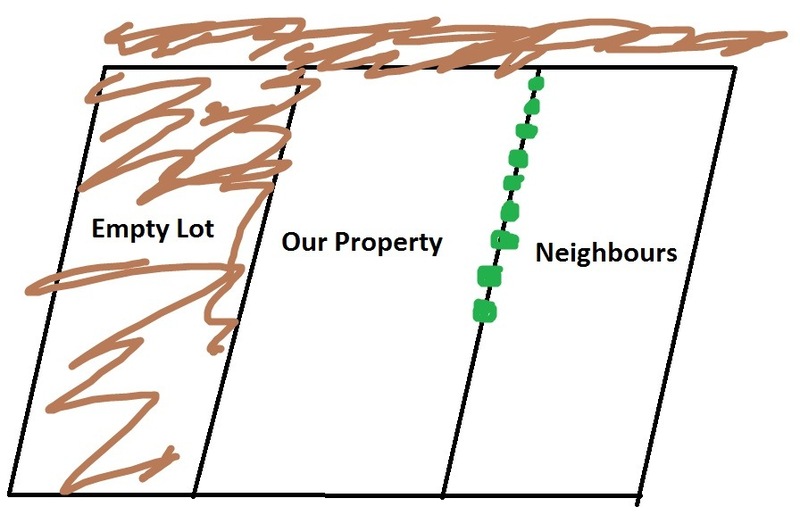 How do you separate your yard from your neighbours yard? Oh, and the hedge only goes up to the corner of the house in the front. We have plans for the rest of the property line and we will hopefully get to that project within the next month, so stay tuned! I love muffins. They're just so tasty and easy to grab for a quick snack or dessert. The other thing I love about muffins, is that the gluten/dairy free ones are actually still pretty tasty. I made them again this weekend and while doing so, I realized that I hadn't blogged about them yet. How could I have not blogged about my favourite muffins ever? Well here I am to remedy that fact. Delicious gluten free dairy free apple cinnamon muffins! They're not too hard to make, even though they have a lot of ingredients. They are a little on the pricier side, since they call for walnuts and dairy-free yogurt, but to me they are worth it. They come together quickly, despite having to chop up the walnuts and apples. I usually double the recipe so that I get more muffins for time invested. And really, doubling is pretty easy to do when you have all the ingredients on hand. Another tweak I made to the recipe this time was replace the brown sugar with coconut sugar and I put less than they called for. I'm trying to cut back on my sugar intake so I've been tweaking a lot of my recipes lately. I also decided that it was the perfect time to try out my new mini-muffin tin that Dan gave me for my birthday. Isn't it always the perfect time for mini muffins? I was completely delighted with my little muffins and may have eaten a few too many. It's just so easy when they are bite size. I only made a dozen mini ones and then almost two dozen big ones. I froze all the bigger ones and kept the small ones out to munch on over the next 24 hours. Although they didn't even last that long. I totally recommend making these muffins, especially if you have dietary restrictions. They are so good, you can't even tell they are gluten-free. Which is a definite bonus since so many gluten-free foods taste like crap. Did you get any baking done this weekend? Are you also a muffin lover? Or do you have another favourite baked good? I'd love to hear about it. I must interrupt the regularly scheduled programming of this blog to bring you the latest breaking news. I weighed myself this morning (like I do every Monday morning) and when the numbers flashed back at me, I gasped. Dan even heard me from the other room. As of 7:00am this morning, on April 22nd, 2013, I weighed 115.4 lbs!!!! I even weighed myself four times just to be sure the scales weren't going wonky on me. Yup, I'm gaining weight baby. That's over a 2 lb increase from last week. What an awesome way to start a Monday morning. Alright, you can return to whatever you were doing prior to this post. Thanks for letting me flaunt a little bit. As I mentioned in Part 4 of the chicken coop, it is currently home to 12 hens instead of the usual 6. We decided that we had quite the little egg market going on and needed some more eggs to keep up with the demand. So a month or two ago, we ordered 6 new ready to lay hens. They arrived a couple weeks back and we have been enjoying collecting 10-11 eggs a day now. We started them out in a "playpen" area in order to introduce them to the old hens without them actually touching. You know, so they could hear and see each other but not be able to beat each other up. It was an awesome idea in theory but we didnt' execute it that well. You see, hens can actually fly. Not that high and not that long but they are definitely able to hop a little fence. So pretty soon, the old and new hens were mixed together and we ended up removing the "playpen" altogether. It took them a couple days to figure out the pecking order and become friends, but they seem to be doing well now. Mia is very good with them and likes to go say hi. We're planning on training her to keep them in the yard so that we can let them free range a bit more this summer. We'll see how that goes though. And in other farming news, we got our new baby chicks! We got 26 little tiny yellow fuzz balls on Thursday and happily played with them before setting them up in their new home. There's nothing like a new little chick to make the world a better place. We only kept them outside for a little bit since we didn't want them to get too cold. But I think they enjoyed their time on the grass. I forgot to take pictures of them inside with a heat lamp on them but I'm sure you can imagine it. They are actually living in the hen house right now until they get a little bigger, since it's so cold out. Once the weather warms up and they have more feathers on them, we'll be transferring them to the new chicken coop where they will live until mid-July. Oh, and unfortunately we have already lost three of them. It makes me so sad and guilty. I know it happens and it's a part of life but still, I kind of want to cry. The remaining 23 are all looking good and healthy though so hopefully we don't lose anymore.